CAMRA members outside the Crown Inn in Surfleet. Real ale lovers returned to Surfleet recently for an annual tradition that began in the village. The Fenland Branch of the Campaign for Real Ale (CAMRA) began their annual walks in Surfleet 18-years-ago. Since then the members have met monthly at different pubs around South Lincolnshire on a Sunday. 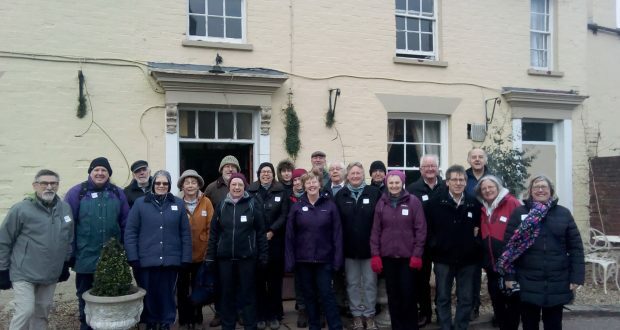 The recent Anniversary Walk saw 22 members take in establishments including the Crown Inn. Membership secretary Heather Girdlestone, said: “The walks offer members a chance to check out pubs included in the CAMRA Good Beer Guide and sample the real ale. “We also have lunch together at one of the pubs on the walk, which are normally excellent value.